Yesterday I wasn’t feeling well. Somehow my brilliant husband saved the day! He met me at one of our favorite little bakeries and greeted me with a card to commemorate the anniversary that I hadn’t even considered. Four months as a New Yorker. I did still just want to go to sleep but I wasn’t miserable anymore. Among other touching sentiments he thanked me for participating in his “goose-chases.” This is a joke in our house. He loves to wander aimlessly and I love to wander with a purpose. How two drastically different personalities found one another is just something I’ll have to be grateful for. 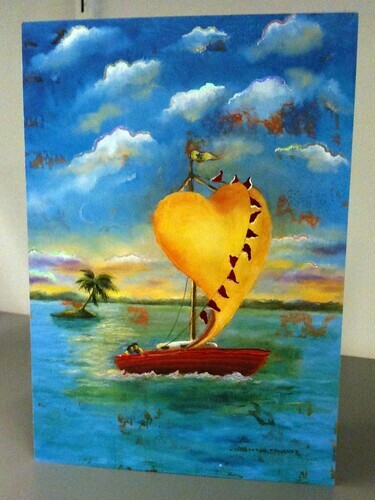 But I love that the card depicts us floating along together. Likely goose chasing. We finished the night with some delivered food and some basketball on tv. perfect. This entry was posted in everything i've blogged, observations and tagged anniversary, Firsts, NYC. Bookmark the permalink. Jennifer! Tell me about it – I toiled for hours over the name, I’ve heard every joke/reference in the book and sometimes you just have to go with the flow. Thank you so much for reading & visiting me. See you soon, I’m sure.